The Haunted Boy. The new film/documentary from the Booth Brothers as seen on SyFy. The True story behind The Exorcist, Halloween Sold Out World Premiere, St. Louis. Trailer/TV Spot. 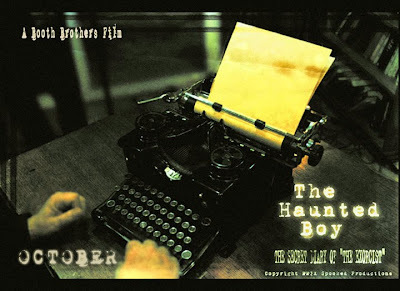 BOOTH BROTHERS TALK “THE HAUNTED BOY” TO FANGORIA! Anybody interested in the paranormal ought to consider the Booth Brothers’ portfolio. For the past several years, these flamboyant twin filmmakers (Christopher and Philip) have turned themselves into virtual paranormal archaeologists, traveling to some of America’s most distressed locations to turn over rocks that may be holding down nasty supernatural secrets for documentaries like SPOOKED and CHILDREN OF THE GRAVE. They’re at it again with THE HAUNTED BOY: THE SECRET DIARY OF THE EXORCIST, which just made its DVDebut, and they provided Fango a few exclusive images. Author William Peter Blatty wrote his classic novel THE EXORCIST with the infamous 1949 case of “possessed” child Robbie Mannheim in mind. THE HAUNTED BOY utilizes a diary kept by Raymond J. Bishop, one of the priests who was witness to the events, like a map, as it guides the Booths (who also created the fact-based feature film DEATH TUNNEL) from relatives of the priests and Robbie—who is still alive and well—to a variety of locations, from churches to the home where the symptoms first started. Excerpts from the diary are woven throughout the documentary, though it isn’t necessarily the primary focus. 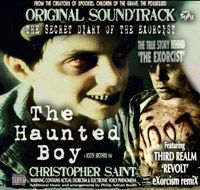 THE HAUNTED BOY features a wealth of interviews, from Ouija-board victims (yes, it’s relevant here) to priests to demonologists. There are also scenes utilizing EVP in the Alexian Bros. Hospital, where Robbie’s exorcism was completed and where the diary was originally found. Exorcism aficionados will be interested to learn that several sound clips heard in the film were pulled from an “actual exorcism audio archive,” allowing viewers to hear the cries and wails recorded during various rituals. Most upsetting is learning that some of these recordings derive from the tragic “exorcism” of Anneliese Michel, whose story inspired THE EXORCISM OF EMILY ROSE. Christopher explains that the brothers were granted access to this material by priests, but with a stipulation attached. “We were not to play the part where they call out the devil by name,” he says, the reasoning being that the priests believed that widely broadcasting direct attention to a force of evil was an unnecessary risk—there was no need to provide such a spirt with any form of mass acknowledgement. Philip adds, “They allowed us [access] but they begged us—‘advised’ is a better word—not to play the part where they address the demon by name. We couldn’t play that, because we felt very strongly that if we were going to put it in the show, we could use the groaning and the moaning and that guttural sound—chilling. So we just said, ‘That’s a good idea—we don’t want to put on a show that promotes evil. 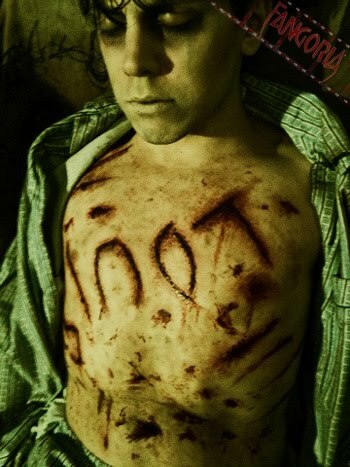 We just want to tell the story.’ “THE HAUNTED BOY” TO FANGORIA! By Chris Haberman. 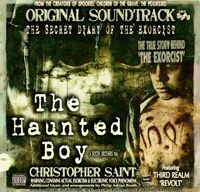 THE HAUNTED BOY: THE SECRET DIARY OF “THE EXORCIST” DVD review By Alyne Pustanio. In The Haunted Boy paranormal “dream-team” filmmakers Christopher Saint Booth and Philip Adrian Booth investigate the real-life events that inspired author William Peter Blatty’s book and the wildly-popular film, “The Exorcist” and take us on a journey into a reality that is frightening yet ultimately inspiring. The Booth Brothers can also be commended for not missing an opportunity to educate the general public about the dangers of the paranormal; the film includes footage of the brothers speaking to a classroom filled with students approximately the same age as the possessed boy when he began experimenting with the Ouija board, the singular object believed responsible for bringing about the harrowing circumstances of the Haunted Boy’s demonic possession and torment. The Booth Brothers also provide further evidence of the dangers of Quija through interviews with individuals who have experienced psychic and physical attacks – even contact with infamous serial killers! – through ignorant experimentation with the board. The film culminates in a visit to the actual, real-life childhood home of the possessed boy – the place where it all began – and the “pay-off” is a big one! With the help of professionals such as Greg Myers and Sandra Oates of Missouri’s Paranormal Task Force, and medium Vicki Main, R.N. drawing on the help of St. Michael the Archangel, the Booths confront the demonic entities still lurking at the location. Several graphic scenes – including a demonic attack on expert Greg Myers – prove that the Booth Brothers have no fear of “pushing the envelope” when it comes to confronting true evil face-to-face. Input from individuals such as Father Francis X. Cleary, S.J., and Father W. Faherty, S.J., witnesses to the actual 1949 exorcism, and Thomas Sachy, M.D., a Forensic Criminal Psychiatrist who specializes in the study of genuine possession, and poignant remembrances by relatives such as Eileen Dreyer, the great-niece of Fr. William Bowdern, the man who – in faith alone – faced down the Devil himself, help to round out this thrilling exploration of one of the most enduring and disturbing events in paranormal history. One viewing of The Haunted Boy should leave no doubt in anyone’s mind that possession by demons is a very real danger to humankind. To their credit, however, the Booth Brothers choose not to allow the darkness of the subject to be all that we take away from the record of their experiences. In the end, The Haunted Boy, for all its oppressive subject-matter and disturbing evidence of the reality of hell, successfully reaffirms in the viewer a faith in the goodness of mankind, and an admiration for the faith and courage those who deal directly with the supernatural must draw on every day. SYNOPSIS: Cinematography by Philip Adrian Booth. Original Score by SAINT. Written, Edited and Directed by The Booth Brothers. RT(88 minutes) Not Rated, SD/HD format, Dolby Digital, Stereo, 5.1 Surround. DVD features TBA. 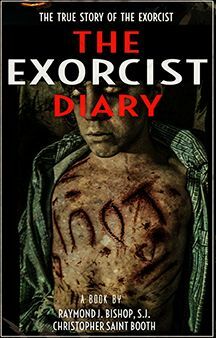 Plot Outline: While filming a haunted asylum in St. Louis, Missouri, documentary filmmakers uncover a secret diary of the infamous 1949 exorcism involving a 13 year old boy possessed by the devil that later inspired the book and movie “The Exorcist”. Utilizing hi-tech paranormal gadgetry along with a legion of supernatural experts they search out to capture the scariest entity known to man, “The Unholy Ghost”. Nothing you have ever seen or heard before gets you closer to the ungodly truth of what really happened in this most terrifying, best selling story of all time! This is the untold-real story of “The Exorcist”, a chronicle of true events based on the actual priest’s secret diary the world was not to see, Until Now! For the first time ever, investigate the real ‘Exorcist’ house and the infamous Haunted Boy’s bedroom where this horrific possession and exorcism occurred. Battle demons while exploring ancient churches and asylums with the last surviving eyewitness priests. See never-before-seen case files, historical events, paranormal evidence from world renown supernatural experts. Exclusive interviews with the actual Exorcist’s and the Haunted Boy’s blood line. With all the creepy exorcism sensationalism going on lately, it was due time for a non fiction piece to arrive on the scene that wasn’t all B.S with cleverly edited hand held camera tricks. In fact, every time I turn on the TV, another “expert” is visiting distressed old buildings claiming to be able to capture disembodied spirits or evil entities. The thing I love about the Booth Brothers excursions is that they don’t claim to be expert ghost hunters, but they are expert filmmakers. Usually they enlist the aid of noted experts to accompany them while they shoot, educate and dig into the history or the locations they visit. It’s all done beautifully, hauntingly and usually leaves you with a sense of dread long after viewing. This latest offering from the “spooked” team takes on a rather cautious tale of a boy who was the original inspiration for the film “The Exorcist”. A real tale that overshadows “The Last Exorcism” 10 to 1 with encounters that are truly frightening. The coverage stems from true events, true testimonies as the team braves the eerie original locations with quite a few harrowing moments themselves. The original tale that inspired the film “the Exorcist” was actually based on a true exorcism event that occurred back in 1949. This event received further credibility when the original diary of the event was uncovered that details the frightful moments from the archives of Rev. Raymond Bishop. The DVD I received contained a printed copy of this very diary for those who want to read long after, though it’s the film itself that will send chills down your spine. As all their previous projects, the Booth team lights up the screen with there flavorful brand of editing using graphics, staged footage and of course the on scene documentary footage that they based the whole film on. As we learn about the haunted boy who was documented as being possessed even at the level of the Roman Catholic Church, we discover a dark entity, demons and past tales that will scare the church right back into ya. The crew visits 3 locations reported to be where the boy received exorcism treatments. St. Louis, Missouri which houses an old asylum turned into apartment buildings still to this day does not house occupants on the 5th floor as recommended by the local priests. A floor that perhaps contains some remnants of evil itself is explored with some interesting footage caught on tape. What is most frightening is the visit to the previous exorcised boys house now owned by new neighbors. The room which is in renovation proves to be a visit you soon won’t forgot. A resident ghost hunter, the film crew and a physic all visit this house and let the cameras roll. Not only is the visit frightful but the captured EVP to audio words device pulls up some pretty crazy stuff. Accompanied by a masterful “Saint” score, the material sets a pretty dark mood to latch onto. As the film rolls on, we are told about some of the original furniture deemed haunted that was removed from the locations and sealed away in a wooden box. This box now sits within a military facility never to be opened again. I found that bit of information rather unique and concerning that so much trouble was invested into a material object to be kept under wraps and careful watch. As we learn more about the boy, it appears that every location and setting that existed is under scrutiny of bad karma that had anything to do with the reported exorcism and its surroundings. At one point, I was confused by the various locations talked about, but what I got from it was that the boy was moved around a bit. CUSTOMER REVIEWS: WHAT PEOPLE ARE SAYING ABOUT THE HAUNTED BOY DVD! I just saw The Haunted Boy and just want to say, you both did an out standing job. I hope now people will wake up and see it as truth and not in fear. God bless you all in the making of the documentary.